Written by David Carson (Choktaw), co-creator of the very popular Medicine Cards oracle deck, this book is an introduction to spirit clans, our most ancient spiritual roots. A spirit clan is your spirit mother and father—your original blessing that you carry inside you. A clan can be guided by an animal, a plant, a stone, an object, such as an arrow, or even a phenomenon, like fire. Knowing and understanding your clan will empower you, help carry you through life, and see you through difficult times. An introduction to spirit clans is presented along with an overview of shamanism and ways to discover your clan through dreams, visions, and meditation. Thorough explanations of the physical, psychological, and spiritual aspects of 75 clans are included, and stories, traditions, and descriptions of modern day clan manifestations lift the teachings off the page and into life. 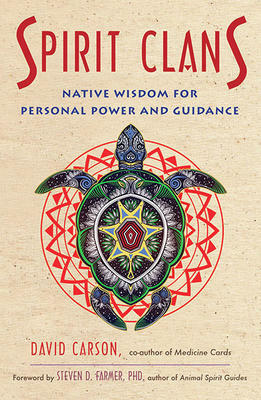 This book is an introduction to spirit clans, our most ancient spiritual roots. A spirit clan is your spirit mother and father - your original blessing that you carry inside you. A clan can be guided by an animal, a plant, a stone, an object, such as an arrow, or even a phenomenon, like fire. Knowing and understanding your clan will empower you, help carry you through life, and see you through difficult times. An introduction to spirit clans is presented along with an overview of shamanism and ways to discover your clan through dreams, visions, and meditation. Thorough explanations of the physical, psychological, and spiritual aspects of 75 clans are included, and stories, traditions, and descriptions of modernday clan manifestations lift the teachings off the page and into life.